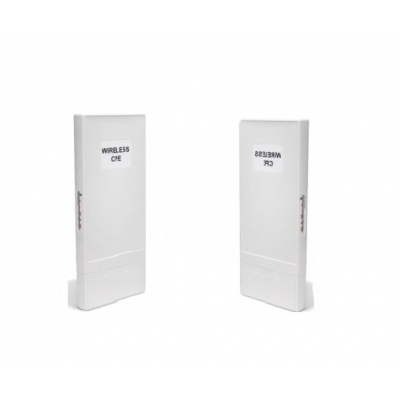 Outdoor Long Range 5GHz Wireless AP/CPE/Bridge Link that provides wide coverage of network connection in existing environment. It can operate up to 300Mbps data rate by supporting IEEE 802.11a/n standard and with full WEP, WPA/WPA2 data security, Wireless LAN Access Control List and TKIP/AES encryption, It keeps the data transmission safe in any network connection mode. Moreover, it supports different operation modes for any user’s applications like point to point network and IP surveillance. 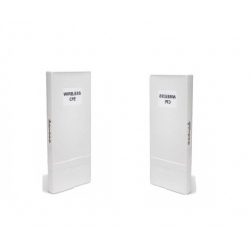 Link include two outdoor high speed 300mbps 2x 2 CPE AUN-344 with integrated 14dBi Antennas. AUN334 is a cost effective effective 802.11n 2x2 MIMO outdoor AP/CPE operating in 5GHz ISM band (5.5~5.9GHz) that is also compliant with IEEE 802.11a standard. It has a build-in 15dBi dual-polarization antenna, but can also co-work with other external antenna by easy software configuration. The AUN334 supports 12V DC passive PoE Input and one POE output port (max. up to 12W) for other passive POE device for IP-65 grade outdoor installation. ATA-171M 1 Port FXS FXO SIP IP Gateway - NEW !